WELCOME Here, creativity rises above the usual and ordinary. Whether you enjoy exhibitions of contemporary art, or fun-filled festivals where you can touch the artwork and become a performer yourself. Whether you want to take a class, attend a talk, see a film, tour public artwork or watch artists at workâ&#x20AC;&#x201D;we have something to ignite your imagination. Breckenridge Creative Arts serves artists, creatives, cultural enthusiasts, visitors and residents with a year-round schedule of creative happenings throughout our picturesque mountain townâ&#x20AC;&#x201D;from the concert hall, local theaters and galleries we manage, to the Breckenridge Arts District, a campus of quaint historic structures that offers a full calendar of classes, workshops and open studios. Nestled in a cozy valley under spectacular snow-capped peaks, we invite you to join us in the exchange of ideas, to collaborate and revel in creative community. It is our sincere hope that you, too, will find inspiration in this most unique of places. ARTS DISTRICT The Breckenridge Arts District is a hub for creative experience, bringing together studios, galleries, performance spaces, historic landmarks, public art, restaurants, cafĂŠs and other creative businesses that animate and populate a vibrant cultural corridor in downtown Breckenridge. The districtâ&#x20AC;&#x2122;s core attraction is a lively arts campus of renovated historic structures that now function as studio spaces for classes, workshops, affordable rentals by local artists and visiting artist-in-residence programs. The Breckenridge Arts District is a Certified District in the Colorado Creative Industries Creative District Program. PICK-A-PROJECT SERIES Woodworking + Welding Choose between 3 simple projects and work at your own pace, enlisting our instructors for project tips, advice or help. Drop in any time between 5:30–8:30pm and stay as long as you’d like! BCA will supply materials, tools, instruction and inspiration. Welding Drop-in | $30/$23 for BCA Members Pick-a-Project: Pencil Holders, Bookends + Horseshoe Wine Racks: Thu, 5:30–8:30pm* | 5/2–7/11 *No class 7/4 Beginner Welding: Tue, 5:30–8:30pm | 5/7–8/6 Open Studios | $16/$12 for BCA Members Sun, 5–8pm | 6/9–7/28 Woodworking Drop-in | $30/$23 for BCA Members Woodworking Basics: Tue, 5:30–8:30pm | 5/7–8/6 Pick-a-Project: Doormats, Wine-holders + Planters: Thu, 5:30–8:30pm* | 6/6–6/27 Series | $120/$90 for BCA Members Build a Doghouse: Fri, 5:30–8:30pm | 4-week series: 6/7–6/28 + 7/5–7/26 Open Studio | $16/ $12 for BCA Members Wed, 5:30–8:30pm | 6/5–8/7 *No open studio 6/26 + 7/3 *Pick-a-Project: Drop in any time between 5:30–8:30pm and stay as long as you’d like! All participants, even pre-registered, are required to check-in at Old Masonic Hall, 136 S. Main St., prior to class. Please allow a minimum of 10 minutes prior to class start for registration process. All drop-in and series prices include materials. Additional materials are available for purchase at Open Studios. PRIVATE INSTRUCTION BCA offers private workshops of varying lengths in the following mediums: ceramics, mountain crafts and skills, drawing, glassblowing, metalsmithing, painting, photography, printmaking, textiles/sewing, welding and woodworking. For groups of 3+ | $50/person Class capacity depends upon medium For individuals | $100/person To schedule a workshop, please contact Becca Spiro at 970 547 3116 ext 1 or becca@breckcreate.org. Please note: Reservations for both group and individual private workshops need to be made two weeks prior to your preferred workshop date. Scheduling will depend upon instructor availability. Materials are included in price. Participants will be charged full amount unless cancellation is requested one week in advance. Credit card information will be collected upon booking. SUMMER CAMPS + YOUTH PROGRAMS Breckenridge Creative Arts offers year-round programming for all ages. Sign up for individual dates, or purchase a season pass and receive unlimited entry. KIDS Creative Play for Pre-K Ages 1–5 | Quandary Antiques Cabin | $8/$6 for BCA Members NEW! $156 for Unlimited Season Pass (May–Aug) *25% savings! Tue, 3:30–4pm | 5/7–8/20 *No class 7/2 + 8/13 Fri, 10:30am–11am | 5/3–8/2 *No class 5/31 + 7/5 *Parents are required to attend. Please register for child only. Crafty Kids Ages 6–12 | Quandary Antiques Cabin | $12/$9 for BCA Members NEW! $126 for Unlimited Season Pass (May-Aug) *25% savings! Wed, 4:30–5:30pm | 5/1–8/7 *No class 7/3 Muddy Buddies Ages 6–12 | Ceramic Studio | $12/$9 for BCA Members NEW! $90 for Unlimited Season Pass (May-Aug) *25% savings! Fri, 10am–12pm | 5/24–8/2 *No class 5/31 All participants, even pre-registered, are required to check-in at Old Masonic Hall, 136 S. Main St., prior to class. Please allow a minimum of 10 minutes prior to class start for registration process. ARTISTS-IN-RESIDENCE BCA’s artist-in-residence program offers regional, national and international artists of all disciplines an opportunity to focus on process rather than product while engaging with the local community in a meaningful way. For more information, visit: breckcreate.org/artists-in-residence The artist-in-residence program is a partnership between Breckenridge Creative Arts and the Saddle Rock Society. BIKE-IN MOVIE NIGHT Jun 26 | 7–11pm FREE | Breckenridge Arts District An outdoor screening of the classic Pee-wee’s Big Adventure preceded by activities on the lawn and thematic short films curated by the Breckenridge Film Festival. Part of Bike to Work Day and co-presented by Breckenridge Creative Arts, Breckenridge Film Festival and Breckenridge Tourism Office. ARTISTS-IN-RESIDENCE LOCAL AIRS Local artists are invited to apply for a studio residency in the Fuqua Livery Stable for 4â&#x20AC;&#x201C;8 weeks, where they contribute to and benefit from a communal atmosphere that fosters creative practice, new relationships and knowledge-sharing. In exchange for a private work station/storage area, a free BCA artist membership and unlimited use of all campus studios for independent work, artists must commit to weekly working studio hours that are open to the public. For more information or to apply to be a local artist-in-residence, please contact Becca Spiro at 970 547 3116 ext 1 or becca@breckcreate.org. DATE NIGHTS Gallery@OMH, 7–9pm | Fri, Jun 7 + Jul 5 $20/$15 for BCA Members Join BCA for a fun evening of romance and art-making. Whether you are a couple or single looking for a night out, all are welcome on the Arts District campus for a hands-on ceramic project (no wheel required!). Bring your own picnic dinner and enjoy a drink on us. Pre-registration is required and includes one drink; 21+, please. *Participants will not take home a finished project but will be able to come back and pick up their work after it has been fired. SONIC LODGE Monthly, Dates TBA | 8â&#x20AC;&#x201C;11pm $5 Suggested Donation | Gallery@OMH Join us on the gallery floor for a monthly evening of live music and interactive art. Experience the current exhibition at Gallery@OMH along with a concert performed among the installations. Broken Compass Brewery will host a cash bar throughout the night. Please check breckcreate.org for updated dates and bookings. STREET ARTS: SPANGLED Jul 4 | 10am–5pm FREE | Arts District Campus An Independence Day event celebrating freedom, sparkle and sequined fun, including a pie-eating contest, dog fashion show, denim bedazzling, chalk art contest and summer games on the lawn. Presented in conjunction with the Town’s July Fourth weekend celebration. SONIC LODGE Gallery@OMH, 8–11pm Monthly, Dates TBA $5 Suggested Donation Join us on the gallery floor for a monthly evening of live music and interactive art. Experience the current exhibition at Gallery@OMH along with a concert performed among the installations. Broken Compass Brewery will host a cash bar throughout the night. Please check breckcreate.org for updated dates and bookings. BIKE-IN MOVIE NIGHT Arts District Lawn Wed, Jun 26, 7–11pm, FREE An outdoor screening of the cult cycling classic “Pee-wee’s Big Adventure,” preceded by thematic short films curated by the Breckenridge Film Festival. Part of Bike to Work Day and co-presented with Breckenridge Film Festival and Breckenridge Tourism Office. DATE NIGHTS Jun 7 + Jul 5 | 7â&#x20AC;&#x201C;9pm $20/$15 for BCA Members | Gallery@OMH Join BCA for a fun evening of romance and art-making. Whether you are a couple or single looking for a night out, all are welcome on the Arts District campus for a hands-on ceramic project (no wheel required!). Bring your own picnic dinner and enjoy a drink on us. Pre-registration is required and includes one drink; 21+, please. Participants will not take home a finished project but will be able to come back and pick up their work after it has been fired. Please note: BCA does not ship artwork. MAY 30â&#x20AC;&#x201C;JUN 2, 2019 Join us in Breckenridge for a festival of cutting-edge works of contemporary public art, featuring a variety of interactive installations, musical performances, screenings, digital art and eye candy of all sizes. Presented by Breckenridge Creative Arts. TEACHER ACADEMY South Branch Library, 103 S. Harris Street | FREE Jun 24–Jun 28, 1–4pm Comprehend, Reflect, Create + Transfer: Incorporating Visual Art Standards into Everyday Curriculum Participants must attend all days to receive graduate credit. Earn graduate level credit from Adams State University through BCA’s Teacher Academy. Over the course of 5 days, teachers will learn how to incorporate the Colorado Visual Arts Standards into lesson plans. Through an exploration of current and previous exhibitions produced by Breckenridge Creative Arts, participants will develop activities appropriate for a range of ages and subjects. Activities include: discussions, participating in hands-on/minds-on activities and presentations. The course may be used for salary advancement and re-certification. Upon successful completion of the course, teachers will earn one graduate credit. 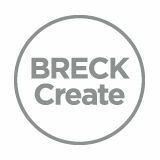 Register through breckcreate.org. For more information, contact Becca Spiro at at 970 547 3116 ext 1 or becca@breckcreate.org. BCA PRESENTS Riverwalk Center; dates to be announced A program of ticketed concerts, lectures and performances with regional, national and international talent. FESTIVALS WAVE: Light + Water + Sound Blue River Plaza May 30–Jun 2, 3–11pm, FREE A four-day festival featuring interactive artworks, temporary installations and musical performances in and around the Blue River Plaza, transforming the river, bridges and waterfront area into outdoor canvasses and exhibition spaces. 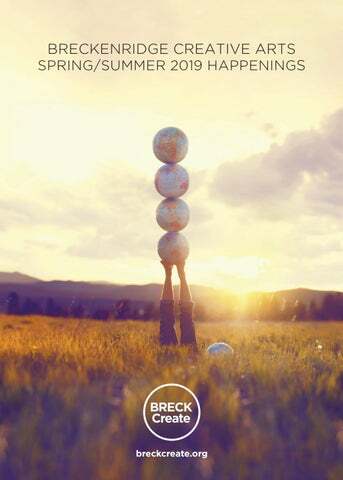 Breckenridge International Festival of Arts (BIFA) Aug 9–18, FREE + Ticketed A 10-day program of extraordinary events in spectacular places and spaces across Breckenridge. Inspired by themes of environment and mountain culture, the multi-arts festival brings together an eclectic mix of music, dance, film, visual arts and family entertainment. AUG 9â&#x20AC;&#x201C;18, 2019 Join us in Breckenridge for a 10-day festival of extraordinary events in spectacular places and spaces. Inspired by themes of environment and mountain culture, BIFA is a multi-arts celebration that brings together an eclectic mix of music, dance, film, visual arts and family entertainment. Presented by Breckenridge Creative Arts. REGISTRATION Online tickets.breckcreate.org 24 hours a day, 7 days a week In-Person Old Masonic Hall, 136 S. Main St. Mon: closed Tue + Wed: 3–8pm Thu–Sun: 9am–8pm Riverwalk Center Ticket Office, 150 W. Adams Ave. Mon–Sat, 12–5pm By Phone Riverwalk Center Ticket Office | 970 547 3100 Mon–Sat, 12–5pm All participants, even pre-registered, are required to check-in at Old Masonic Hall, 136 S. Main St., prior to class. Please allow a minimum of 10 minutes prior to class start for registration process. For online and phone orders, there is a $1 to $4 per registration service fee. There is no service fee for members or in-person orders. Space is limited for drop-in participants; first-come, first-served. GENERAL INFORMATION Class Cancellation All classes and open studio sessions run as scheduled, regardless of number of registrants. If it is necessary for BCA to cancel a class for any reason, registered participants will be notified as soon as possible and offered another workshop or a full refund. Gallery + Registration Hours Gallery@OMH, Old Masonic Hall: Mon: closed Tue + Wed: 3pm–8pm Thu–Sun: 9am–8pm Gallery@SBL, Community Center + South Branch Library: Mon–Thu, 9am–7pm; Fri –Sat, 9am–5pm; Sun 1–5pm Gallery@BRK, Breckenridge Theater: Hours vary; contact Nicole Dial-Kay at nicole@breckcreate.org to schedule a visit. Membership Discounts BCA members receive a 25% discount on class and open studio fees. There are no member discounts on costs of materials. Payment BCA accepts American Express, Discover, Visa, MasterCard, exact cash and check. In addition, PayPal may be used for online purchases. Refund Policy Refunds will only be offered to patrons who have registered for a class that has been canceled. Individually purchased classes are otherwise non-refundable. Welcome Bag Packers. Breckenridge is a beautiful place. And weâ&#x20AC;&#x2122;re committed to keeping it that way, with sustainable practices that are easy for guests and residents to embrace. Thanks for shopping with your reusable bag, or buying one of our limited edition bags at local merchants. Together, weâ&#x20AC;&#x2122;ll reduce the number of disposable bags going to the landfill or littering our pristine local rivers and trails. Come prepared and leave Breck better than ever.